Kenya's Lake Nakuru is in danger of losing its famous pink shores to environmental degradation and pollution. Located in a closed basin in Kenya's Rift Valley region, the shallow salty Lake Nakuru is a unique tourist destination. The lake is world famous for its flocks of flamingo, which literally turn its shores pink. The elegant birds are the main attraction for tourists visiting the surrounding Lake Nakuru National Park. But this site, which provides tourists with one of Kenya's best known images, is on the verge of disappearing. Environmental experts are warning that the lake, which is home to millions of flamingos in their natural habitation, may dry up due to constant destruction of catchment areas and massive pollution. Alice Kahihia, a scientist based at the lake explained, "The level of water has drastically receded. It has reduced by about 300m." Flamingos flock to Lake Nakuru to feed on algae that forms on the lake's bed. However, according to a government study, flamingos are now migrating elsewhere due to a scarcity of algae caused by the drop in water levels. 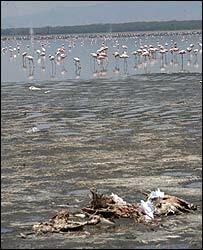 The study also revealed that thousands of flamingos died after consuming toxic waste spilling into the lake from the nearby town of Nakuru. This trend has alarmed hoteliers in the area who depend heavily on tourists. The manager of Sarova tourist resort in Nakuru town, John Njoroge, said: "It is obviously very bad news for people in the hotel industry, such as ourselves, because when the shoreline recedes, it means you have less flamingos. "Once you have less flamingos, or none at all, it will mean visitors will cancel their bookings. Early this year, the government's move to forcefully evict squatters from water catchment areas in the region was heavily criticised by civil society groups and local politicians as an abuse of human rights. Lake Nakuru is one of the leading tourism income earners for the government, generating some $1.3m (£700,000) per month. Against this background a conservation lobby group, Friends of Lake Nakuru, has embarked on a diplomatic mission to save the lake and the precious birds.